I love my scented vinegar cleaner. I’ve been using the Orange Vinegar Cleaner now for a year and it is fantastic. It has all the benefits of cleaning with vinegar: non-toxic, food-grade, environment-safe, non-allergenic, inexpensive, gentle on hands, deodorizing and effective on all surfaces (except granite or marble) – all while giving me that sweet citrusy smell of orange. 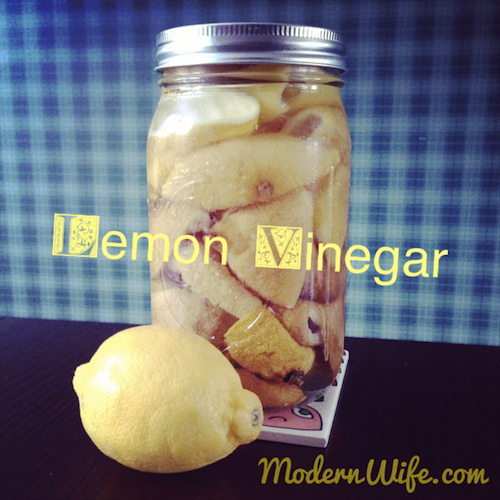 In preparation for spring cleaning this year I am making Lemon Vinegar Cleaner for a stronger, tangier citrus scent. Fill a quart-size glass jar with lemon peel. Make sure the peels are clean. No need to scrub them or anything; just make sure there are no lemon sacs, membranes or seeds getting lost in there. If you don’t have enough to fill a jar yet, freeze it and keep adding to it until it’s packed tight. Pour white distilled vinegar into the jar until it covers the lemon peels, not quite to the rim but pretty close. Screw the lid on and store in a cool dark place for two weeks. After two weeks of soaking lemon peel in vinegar, it’s time to get it out. Set up a funnel into a HDPE 8-oz spray bottle. Pour the lemon vinegar a third of the way into the spray bottle. Top off with water.